This post has been contributed by Greg Hart, Urban Wildlife Programs Coordinator with the Stanley Park Ecology Society(“SPES”). I have been following SPES since I moved into the West End a decade ago and I have been a member for three years. I wanted to offer the team an opportunity to share their news, events, and work so I have created “SPES Saturday” where they contribute and share stories with my audience once a month. The Heron Cam in Stanley Park is now Live! 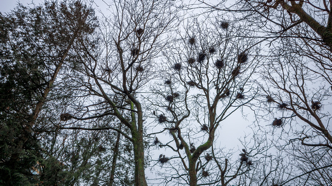 Stanley Park’s heron colony hosts around 100 nests. 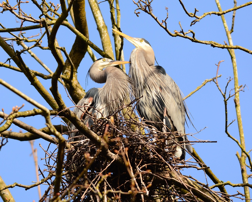 The Vancouver Park Board in collaboration with Stanley Park Ecology Society just launched a new website and an upgraded web camera to watch the Pacific great blue herons. Throughout the nesting season, viewers will be treated to displays of mating, nest building, hatching, feeding and learning to fly. You can immerse yourself in the colony by operating the camera yourself at: vancouver.ca/heroncam. Pacific great blue herons are a distinct subspecies that are considered “at risk” in BC due to their declining population. The thriving Stanley Park colony is unique due to its proximity to the city and its tolerance of the accompanying human activity. This provides a great opportunity for Vancouverites to watch the entire life cycle of these majestic birds. 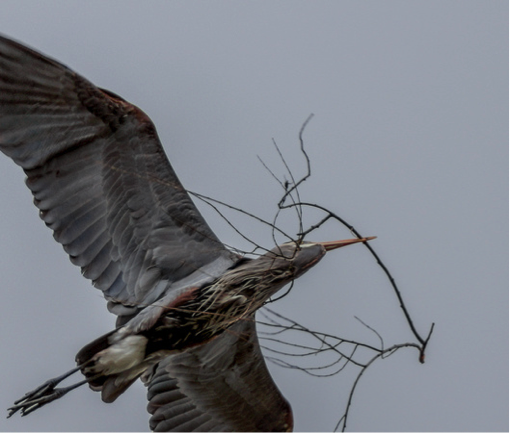 Only the male heron collects sticks for the nest. Photo: Michael Schmidt. Stanley Park Ecology Society helps to monitor, protect and sustain this population. We install protective metal wrapping around the trees to reduce egg predation from raccoons. We close off and allow areas to naturalize around the colony to help reduce disturbances. From the roof of an adjacent building, our monitors record data on the colony including nest success rate and colony size. You can help support our conservation efforts by adopting a nest! We’d love to hear from you. Come by the Nature House on Lost Lagoon to chat with a Nature House Host about the herons or send an email to: nests@stanleyparkecology.ca. You can also join the conversation on twitter using the hashtag: #HeronTalk. We can’t wait to hear your stories and see the excitement unfolding at the colony this year. Herons select a new mate each season. Together they raise up to 4 chicks. 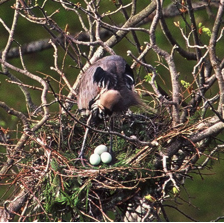 Herons lay eggs in February/March. To learn more about the colony and the herons (like “How can you tell the difference between males and females?”), check out our extensive FAQ sheet or our Fun Facts page. Follow SPES on Facebook and Twitter for the latest updates. This post has been contributed by Greg Hart, Urban Wildlife Programs Coordinator with the Stanley Park Ecology Society . If you want to support a non-profit organization that makes a difference for wildlife and people in Stanley Park, please make a donation or become a member of SPES. For more information visit the Stanley Park Ecology Society website.